For starters, I'm thinking maybe it's sunspots. No, make that sunspot, just one, because after a peculiar lull in sunspot activity, I understand the sun finally coughed one up a few days ago. Maybe that's when our little corner of the universe did a flip and encouraged Washington to admit the country's financial mess BEFORE the November elections. This borders on the incredible. This sort of thing routinely stays below DC's mucky infrastructure until just after voters make their polling place choices, and then, pow, out comes the truth we should have been informed about before, smashed right into our faces as if administered by Uncle Sam cloaked as a jack-in-the-box. Washington is top-heavy with people charged to oversee a nebulous bigger picture, but the economic quagmire remained off the scope -- intentionally, it will be argued, in order to serve those who supposedly serve us -- until it darned nearly burst, spraying its feculent contents across the nation, across the world. Or, hmm, maybe the whole pile was sprung on us prior to the elections clearly for political reasons of another sort. The mind boggles. If we can believe polls, respect for the work Congress performs hovers at a record low. Big surprise there. Anyway, what about Congress and its role in matters of importance, of urgency? With so many issues awarded little more than lip service in the House and Senate over the years, is it really out of the question to assume that the time has come when there's no more space under that congressional rug where matters of masked significance have been swept? Out of sight, out of mind -- out at last? The delicate little matter of UFOs has received some congressional attention, particularly in the House of Representatives, in the past. Nevertheless, for all the word-slinging dramatized on several hastily conducted occasions since the fifties, what did we get? Come on, say it, say the words: We got Dr. Ed Condon and his no-good-feel-good UFO project at the University of Colorado. Additionally, as has recently come to light (I believe this originated with researcher Brad Sparks and his information was related via UFO Updates, though I have not seen Sparks' complete article as I write this), there were far more UFO cases left unexplained by Colorado than indicated originally. Even more fascinating, however, it's now claimed that Dr. Condon didn't even read or review the final report before rubber-stamping the whole fetid mess. So, we really need to ask again, what should Congress do about UFOs? That government entity believes as a whole that the issue was settled in Colorado, even though the preponderance of evidence clearly shows it was not. Yes, there are said to be individual members who would welcome and encourage new hearings about UFOs, but on their own they aren't likely to present a challenge to the uncaring majority. If you've read this blog from the beginning, you've already witnessed a scanned sample of letters I received since the sixties from various congressional representatives. In general, caution is the theme. They don't wish to seem over-zealous about a UFO investigation, yet they aren't about to respond to a constituent by questioning the writer's sanity, either. The traditional approach Congress takes when the UFO topic is broached, a textbook lesson, couldn't have been laid out any better than it was in 1964, when the National Investigations Committee on Aerial Phenomena (NICAP, see link)) published The UFO Evidence, prepared under the superb editorial guidance of Richard Hall. Intended as a warning to Congress that UFOs were important and in need of scientific inquiry, a copy of this book-sized document was given to every member of Congress. However, even with an impressive wave of UFO sightings occurring in the U.S. throughout 1964, congressional response seemed lackluster at best. The thing is, 1964 actually created a "perfect storm" for the UFO issue, or should have. The paradox is that Congress should have gone on full-alert instead of sleeping at the switch upon receipt of NICAP's document because 1964, and then 1965 and 1966, boasted a disturbing array of UFO events. The "nail-biter" UFO cases came rolling in from all over the country, well-witnessed, and this time many involved physical evidence such as landing traces and marks on the ground in quantities perhaps unparalleled since the electromagnetic (EM) UFO events reported widely in the 1950s. Nevertheless, some in Congress politely thanked NICAP for The UFO Evidence, some members voiced concern and then business as usual engulfed the world of legislation and oversight. UFOs associated with 1965's "Great Northeastern Power Blackout" and other reports, and the concern for the 1966 Michigan sightings in then-Congressman Gerald Ford's territory helped herald in what relevant hearings Congress held, but still -- 1964 should have been the banner year for decisive congressional action. "From time to time I would urge the Air Force to make a more thorough study of the phenomenon, but nothing ever came of it. . .As the years went by, I continued to find cases that puzzled me. . .I was not consulted on some key cases. ". . .since 1964, " Hynek continued, "there has been a sharp rally in the number of puzzling sightings. The more impressive cases seem to fit into a pattern. The UFO's had a bright red glow. They hovered a few feet off the ground, emitting a high-pitched whine. Animals in the vicinity were terrified, often before the UFO's became visible to the people who later reported the incident. When the objects at last began to disappear, they vanished in a matter of seconds. . .As the Air Force's consultant, I was acquiring a reputation in the public eye of being a debunker of UFO's. Yet, privately, I was becoming more and more concerned over the fact that people with good reputations, who had no possible hope of gain from reporting a UFO, continued to describe 'out-of-this-world' incidents." Senator Barry Goldwater (R. Ariz.) - August 31, 1957: "I am an Air Force Reserve Officer and have been one for the past 27 years and, consequently, I am, indeed, interested in unidentified flying objects. I, frankly, feel that there is a great deal to this and I have discussed it often with many Air Force Officers. . . "
Congressman William H. Ayres (R. Ohio) - January 28, 1958: "Congressional investigations have been held and are still being held on the problem of unidentified flying objects and the problem is one in which there is quite a bit of interest. . Since most of the material presented to the Committees is classified, the hearings are never printed. When conclusions are reached they will be released if possible. . ."
Senator Thomas J. Dodd (D. Conn.) - February 27, 1960: "Thank you for your recent letter concerning unidentified flying objects. This is a matter which has always aroused my interest and curiosity." In a telecast March 14, Senator Dodd enlarged on his statement in answer to a newsman's question: "UFOs have never been accurately explained. I think there is as much reason to believe that there is something to them as there is for believing that there is not. There is certainly reason for thinking we don't have all the facts and certainly the Senate committee dealing with space should have all the facts." Congresswoman Gracie Pfost (D. Idaho) - March 25, 1960: ". . . regarding flying objects. I am interested in this subject also, and you will want to know that after conversing with the Air Force Department I am not completely satisfied with the information they gave me..."
Congresswoman Florence P. Dwyer (R. N.J.) - April 26, 1960: "I am not one of those who arbitrarily dismiss 'flying saucers' as figments of the imagination. I take them seriously, and I certainly would have no objections to a careful and reasonable investigation of this phenomenon. Too many intelligent and thoroughly responsible people, who have been in positions to observe such unidentified foreign objects, have testified to their conviction that such objects exist for me or anyone else to deny the validity of their observations. Under careful supervision, and with the proper safeguards, I would think that a Congressional investigation would be a worthwhile undertaking. . ."
Senator Harry F. Byrd (D. Va.) - May 9, 1961: "As you know, I am a member of the Senate Armed Services Committee, and this Committee is frequently briefed on the subject matter of your communication. Access to U.F.O. files is necessarily restricted. . ."
June: News stories began to appear stating that the House Committee on Science & Astronautics was considering holding hearings on UFOs. Waterbury (Conn.) Republican, June 20: Bulkley Griffin, reporting from Washington, said the House Space Committee would conduct hearings, "according to present plans of Chairman Overton Brooks. He is designating a subcommittee to hear witnesses. Rep. Joseph H. Karth, (D. Minn.), will head the subcommittee it is stated. . The question whether all the subcommittee sessions will be secret or whether some will be public, has not been finally decided. " In their column June 26, Robert S. Allen and Paul Scott reported: "The Unidentified Flying Objects, that have been mysteriously appearing over the U. S. for years, are going to be investigated by the House Space Committee." July 3, Newsweek, in its "Periscope" column, reported that a three-man House subcommittee would soon start a UFO probe, beginning with Air Force reports. Congressman Glenn Cunningham (R. Nebr.) 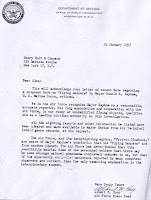 - August 8, 1963: "I think it quite possible that the Air Force is withholding information about at least a certain number of these [sightings] because I have found that the military services in the past have sometimes acted in a secretive way in other matters when there was really no justification for it. . ."
See? The more things change, the more they really do stay the same. Hearings come and go-- or don't occur at all -- and still the questions linger. How about Senator Byrd's interesting statement? Access to UFO files is "necessarily" restricted?!! And now we have official Washington and Congress scratching and clawing through its and Wall Street's inescapable detritus, putting on a public face of cooperation, trying to show us that when emergency action is required they can handle the job. But.. .
Why did the UFO issue not receive such treatment? Too weird, too hard to believe? Throngs of people accept on pure faith that Jesus rose from the dead, but impressive UFO evidence can't be considered, oh no, no. It's so much safer politically to embrace the known, absorb comfort from the legend and exclude the unknown-- even when that unknown screams out for investigation. Military pilot UFO observations and radar confirmation, dangerous airline passenger encounters with UFOs, marks and burns and even radioactive traces left on the ground after UFO landings, astounding examples of immense energy sources associated with UFO propulsion, uncomfortably forthright reports of UFOs related to alleged human abductions -- hello?! Where was Congress? Where is Congress? This is urgent, highly relevant stuff, habitually deserving of "red alert" status, and 44 years ago congressional leaders were presented a golden opportunity and sense of urgency to investigate the issue when simultaneously confronted with astounding new cases and the unique NICAP document calling for action. As a 15-year-old in April of 1964, I remember the sense of awe I felt when the nation's wire services, radio and TV crackled with constantly updated reports of a dramatic UFO sighting experienced by patrolman Lonnie Zamora in Socorro, New Mexico, something about an egg-shaped object accompanied by small beings on the desert floor, an object that took off with a roar, barely missing a dynamite shack. Then other accounts, good reports, began appearing via the nation's press. Within days, the major UFO organizations were sending out bulletins detailing landings, scorched ground, all sorts of evidence that couldn't be ignored. The Socorro UFO itself left behind landing marks and vegetation that continued to burn 24 hours later, even as Air Force investigators and representatives from who-knows-what spook agencies traversed the area. Congress, for the most part, napped. For some reason, other nations appear far more willing to spotlight the UFO as a serious scientific issue, while U.S. officials charged with our defense routinely ignore, politely dismiss, chuckle or sneer away the whole "damned" thing -- at least publicly -- and we tire of their arrogance. Frankly, I expect more from my country's leaders than their current belated attentiveness to mopping up after the thugs and exceptionally bad legislation that allowed the nation's wealth to be plundered and misdirected. But if members of both the House of Representatives and the Senate really care about the future, if they are sincere about supporting science and accomplishing magnificent discoveries yet undreamt, then learning more about and telling us more about who or what randomly invades our air space, our nuclear and military facilities-- and sometimes our very lives -- is the best place to start. We must insist, because we have the right to know. The UFO subject plays no part in today's entry, but a key reason why you're able to read about the UFO subject coherently in this blog does. Upon entry into college in 1972, following my Air Force discharge during the Vietnam Era, it was truly a pleasure to take a total of three English courses with David Feldman, now Professor Emeritus of English and Journalism at Onondaga Community College, just outside of Syracuse, NY. He developed the school's journalism program and was the founding adviser of its student newspaper. Admittedly, I took classes so boring from other instructors that attendance was akin to watching paint or academia dry, but Mr. Feldman's classrooms showcased a teacher with the energy to inspire and encourage students who wanted to learn and improve their abilities to communicate via the written word. As stated, you'll find no UFOs here today -- yet, strangely, mentor Feldman, an Army veteran, recently surprised me with disclosure of his familiarity with the legend of Camp Hero in New York, said to be the source of some very peculiar (not so peculiar, in his view) incidents (Google Camp Hero for more). Perpetually engaged in life's activities, he also taught in the Department of Drama at Syracuse University, and at Lesley College and SUNY (State University of NY) College at Cortland, NY. In the typical male tradition (!) David also knows and loves cars, and several years ago wrote a newspaper column about automobiles and regularly attended popular racing events at Watkins Glen in NY. However, there's another side to the professor, that of successful playwright. Feldman's plays have been produced off-off-Broadway, in Brooklyn, Los Angeles, the Boston area, Ithaca and Syracuse. Notably, he proudly founded Armory Square Playhouse, Central New York's only theater company devoted to the development of new plays by area writers, serving as its artistic director for 23 exciting years. Pictured is David Feldman today and in 1977, when his one-act play, "Steinberg" was produced off-Broadway at the Quaigh Theater in NY City. So, dear reader, should you happen to like the way I write (as opposed, of course, to the things I say and those rare instances when I start raving), a demonstrable portion of style can be directly attributed to my teacher and friend, David Feldman. Yes, this is a tribute, and I'm willing to bet that his name never appeared in a stranger place. Oh, most assuredly not. "Those of us in public life often call upon the press to be more understanding, sometimes with justice. But we also know that the day you are unanimously joined in praise of officials or policies, when power is held in awe and skepticism disappears -- on that day democracy will begin to wither." "Where the question is one of policy and national direction, the bias -- by government and press -- should be toward disclosure. . .There is always a tendency in government to confuse secrecy with security." "We are long past the time when a few men could fully comprehend the operations of government." You're not likely to find this hardcover volume in a used book store, but copies probably still repose in libraries and in the basements of surviving newspapers all over the country. I use the word, "surviving" because, tragically, the newspaper industry currently struggles to avoid dinosaur heaven in numerous U.S. markets. In February of 1968 I shelled out $3.50 for a copy of Problems of Journalism: Proceedings of the American Society of Newspaper Editors, 1967 (pictured). In historical terms, this was a great purchase. Obtaining this particular volume was a must, for this annual convention, held during three April days in Washington, DC, featured something a little different: A Saturday session devoted to a discussion about UFOs. This was a very well-attended meeting with editors from newspapers all over the country, including editors-in-chief from my own Syracuse area, J. Leonard Gorman (The Post-Standard) and William D. Cotter (the former Herald-Journal). Of additional interest was that NY Senator Robert F. Kennedy spoke, presumably Saturday evening after the UFO discussion and the luncheon which followed, at the Society's annual banquet. His comments were not related to the UFO issue, but (as noted above) proved no less relevant to its government and media status. The following year (1968), the world would react with shock and dismay upon learning of RFK's assassination during his presidential campaign. "The UFOs -- What Goes on Here? ", a panel discussion transcribed word-for-word in this 1967 volume, as were all presentations on government, social issues, etc., included a few guests of note. First to speak were pilot William Powell and his friend Muriel McClave, who shared a dramatic UFO encounter just a year before. Powell, a former Royal Canadian Air Force pilot who transferred to the US Army Air Corps in 1942 and later flew commercially for KLM Airlines, joined Bell Aircraft Corp. as an engineering test pilot in 1951. In 1959 he became a company pilot for Sears Roebuck and held that position when the UFO encounter occurred. Having just passed over Willow Grove Naval Air Station in PA at 4,500 feet, Powell and McClave observed jets taking off and circling below them in pairs. As a pair of jet aircraft climbed and proceeded straight ahead of Powell, something he thought was another aircraft approached from the left, headed toward the departing jets. Powell and then his passenger suddenly realized the intruder was no conventional aircraft. The object quickly made an astounding right angle turn and headed directly toward Powell's plane. "We just watched this thing," he stated, " and it proceeded by us. . .at the same altitude approximately 100 yards away. . .and it disappeared from my vision." "We had a very, very clear picture of it at that distance. . .It was actually, you might say, saucer-shaped with a slightly raised dome at the top. It was all well-defined, very clear. The bottom of it was.. .a very brilliant red. The top, the slightly raised dome, was a very brilliant white. 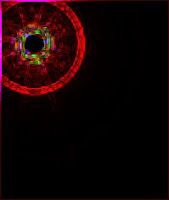 We could not see any portholes or anything -- just a solid object, no lines on it except these two colors." Next was a brief presentation by Maj. Hector Quintanilla, Jr., at that time the chief of the Air Force's UFO entity, Project Blue Book. Quintanilla's scope of interest was primarily to lay out the Air Force's position on UFOs, and there were, of course, no amazing revelations. "The Air Force has made its mistakes. They never have had enough scientists in the project. They have failed to follow up certain sightings of special importance. To me their questionnaire is amateurish, almost cleverly designed in certain cases to get the wrong answer and lose track of the facts. The Air Force is aware of my criticism." Aside from veteran pilot William Powell's UFO encounter, the most worthwhile presentation came from atmospheric physicist Dr. James E. McDonald. The late Dr. McDonald was a rarity among his fellows, as a scientist who actually took the time to investigate impressive UFO sightings and speak with high-caliber witnesses. What he discovered amazed him and set him on a course of writing scientific articles and giving lectures about the importance of the UFO issue all over the world. Unfortunately, Dr. McDonald encountered not only the UFO subject, but personal problems as well (having nothing to do with his UFO interest), eventually resulting in two suicide attempts, the last being fatal. His loss much too soon to UFO research and the scientific world craving his warnings and input remains inestimable. We must keep in mind the time frame in 1967. The Air Force had just awarded the University of Colorado about $300,000 to conduct a supposedly open-minded UFO study, uninfluenced by the Air Force or other official agencies. At this juncture, it was far too early to realize how flawed the Colorado study would become as project members were bullied and memos reflecting pronounced unscientific negativity made the rounds. For all of the science and statistical information that did result from Dr. Edward U. Condon's project, the fact that Condon had insisted almost from the start on negative findings about the phenomenon made Colorado's conclusions both suspect and in no way the final word about UFOs. Also, a high proportion of the UFO incidents specifically examined in the study ultimately remained unexplained. Recalling the United States UFO wave of 1952, a period that precipitated formation of the CIA's "Robertson Panel" of scientists who wanted to actively downplay the UFO issue publicly in order to avoid clogging vital intelligence channels with troublesome UFO reports, McDonald told the audience of his recent visit to Maj. Quintanilla's Project Blue Book office: "I was startled when I. . . saw five feet of shelving just devoted to the 1952 wave of sightings." "Something is going on here of the greatest scientific interest that has been shoved under a rug, ridiculed and laughed out of court. You and your feature writers have helped ridicule it. It's easier to write a funny story. And once the Air Force tells you there is nothing to it, what is more logical than to say, 'People see things; there are a lot of nuts around the country?' And that has led to the net effect that very few of these are reported. "For example, Mr. Powell's report never got on the wires." Are there conspiracies involved? Not exactly, according to Dr. McDonald: ". . .I do not think it is a grand coverup. It is a grand foulup, a foulup of incredible proportions, unprecedented in my experience. "If you read The New York Times and your own paper, you won't have heard of (specific new reports mentioned), because we have collectively helped the Air Force forget about this somewhat uncomfortable problem. And you have helped. Yet, the evidence is simply astounding." What are UFOs not? "They are not advanced test vehicles; they are not hallucinations," warns McDonald. "I have had three sessions with psychologists and I have asked them, 'Is there anything in your clinical experience that would match this?' The answer is, 'No, it certainly doesn't sound like anything psychological.'" And there are radar incidents aplenty, he notes, effectively kept under wraps since 1953. Almost prophetically, McDonald comments about the new, doomed Colorado project: "I am uneasy about the Colorado Program. There is not nearly enough scientific talent on that program. I have said that quite openly. . .to many people in Washington. It should be beefed up immediately. What we need is much more attention to this problem, and that, unfortunately, requires money. "But it also requires people, and that is what is short out at Colorado. I'm afraid they have not taken the problem seriously enough to muster the scientific talent to do justice to that." Conjuring up the agency NASA, McDonald adds, " Amusingly, all my efforts to interest NASA in this gives me the feeling that they think it's nonsense, too. I think they have been hoodwinked and sort of unintentionally brainwashed for years and years. . .It's just a foulup. But a foulup of really incredible proportions." Recounting other aspects of his research, McDonald states, "There are many airline reports in the old evidence. But once the Air Force began to discredit pilots -- and they have, in some cases, unmercifully discredited them -- that source of information pretty much dried up. "That can be changed. Mobile teams need to be prepared. . .I discussed this in the Pentagon last week with the people who know a great deal more about that sort of thing than I do." Again, gently scolding newspaper editors for their handling of UFO news reports, he offers, "The heart of the problem is the 'ridicule lid,' and you're sitting on it. You're sitting on it in a way that is very important. Get off the lid! That is, get your wire service people to take it seriously; look at the problem yourself; examine it for yourself and get off that lid, because that is a big part of the problem now." More than 40 years after McDonald's presentation before the newspaper editors of America, his words still ring true. Colorado University's UFO project was ultimately a waste of tax money, as well as a scientific research disgrace, UFOs still require investigation (for my part, I'm quite happy not to have been in a nearby aircraft when that very recent UFO hovering over Chicago's O'Hare Airport shot upward, blasting a hole into any clouds obstructing its exit, thank you), and many among the working press still find the UFO topic as laughable as a pie in the face. Bushels of UFO-related books seem to appear every year, and there are probably only a few worth the effort. I used to review books, and I saw (and ignored) worthless clunkers routinely. As you might suspect, these days I not only don't review UFO books much, I really don't even keep up with them. I guess that Stanton Friedman has a new one out about UFOs and physics, and that should be worth reading. Nor have I seen the book written by Betty Hill's niece, though I'm absolutely sure that one's a keeper. Nevertheless, I tend to perk up on those rare occasions when an author devotes a few lines to mention something about me. Me? Good grief, you mention my name in your book and it's as if I received an Academy Award. I guess I'm easily entertained. This time around, I do feel honored to apparently occupy a small space in UFO researcher Robert Hastings' new book, UFOs and Nukes: Extraordinary Encounters at Nuclear Weapons Sites (see cover). I've read with interest some of his previous writings about this subject (see his paper posted at NICAP.org, just check his name at the on-site search engine), and now that a few passages from his new book have been posted online at various sites, I expect that Hastings' privately published book is one of those rare worthwhile contributions to UFO literature -- a perfect complement to former Air Force Capt. 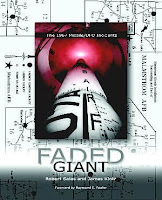 Robert Salas' book, Faded Giant, a personal account of his own dramatic UFO experience at a nuclear base (see cover, and also check out my previous posting months ago about Capt. Salas -- refer to web page search engine above). Hastings references a 30-year-old issue of OMNI Magazine in which my letter to the editor criticized UFO debunker James Oberg for not disclosing his then-current Air Force affiliation as he excoriated UFO researchers, cases and witnesses. My letter was followed by a blistering response from Oberg, but in his book Hastings defends my comments and soberly takes Oberg to task for his own (needless to say, I'm quite content to find myself on the happy end of Hastings' literary weapons of admonishment). As a matter of fact, to include something here that I never felt worth the mention previously, when I taught a few sessions of a noncredit UFO course at Onondaga Community College in NY in the late seventies, somebody known personally by Oberg attended a semester faithfully. He was a very pleasant man, listened intently to everything I said and most assuredly informed James of all essential information. Yes, I did feel a tad uncomfortable when broaching a segment on famous skeptics and debunkers and, by virtue of James Oberg's popularity as a UFO debunker at that time, needed to offer a few criticisms to the class while the person sat in silence just a few feet away from me. Oh, how I wished at that moment that James was a chicken rancher or vacuum cleaner salesman devoid of UFO interest or notoriety -- anything but, by necessity, the subject of my classroom lecture. A few months ago, we posted a letter received several years back from Sen. John McCain, and I'm sure that little spark of publicity helped him ascend to the top of the Republican presidential candidate pile. Hmm, yes, yes, I also posted an older letter from Democratic candidate Rep. Dennis Kucinich, and his campaign fell flat on its face. Well, don't blame me. Anyway. . .
"My friends, you know where I stand on a variety of issues, and we'll explore them further at the national convention next week. But today, on my 72nd birthday, and on Governor Palin's 20th wedding anniversary, in addition to my nomination of her as my vice-presidential candidate, I want to extend the many definitions of this day in one more direction. "The subject of UFOs has long been the subject of controversy, speculation and ridicule and, in fact, the University of Colorado was given a government contract in the sixties to look into this matter. Their conclusions didn't really tell us much, but the study seemed to indicate absolutely no reason for concern. However, there were allegations of dishonesty at the project's highest levels, and even today, as people in this country and around the world continue to report observations of unusual things in the sky, the UFO issue remains unsettled among the public. "When you elect me President, I will make you this promise: Just as other nations have been releasing their files on this subject recently, the United States, too, will strive to make sure that the American people know everything our government knows about this subject. I will issue an executive order to release all UFO-related information that doesn't involve national security, and if there are questions in this regard we will make double and triple-sure that national security really enters into this release of information. "Let's finish the work that Project Bluebook and its predecessors began. Let's clear up, once and for all, the rumors, the absolute fiction and the truth about this issue. If we determine that the evidence warrants a new scientific study sponsored by the government, and if we determine there is important scientific knowledge to be gained from a new project, I will ask Congress for funding and initiation of a comprehensive project to be conducted fairly and strictly in compliance with the American people's right to know. "The truth is, Project Bluebook's original chief, Capt. Edward J. Ruppelt, felt there was considerable importance attached to the phenomenon of UFOs in the early fifties, as did other high-ranking personnel who monitored the project. Over the years, a number of military personnel and an impressive base of other witnesses have claimed encounters with UFOs. The ongoing controversy and alleged evidence associated with this issue requires a measured and honest response from our government. "Even in the House and Senate, I've known colleagues who expressed concern about this subject. The late President Gerald Ford became very energized about an investigation in the sixties when his home state of Michigan experienced UFO sightings. The late Arizona Senator Barry Goldwater, a military member and pilot himself, believed there was far more to the UFO topic than even he could access. And, of course, President Carter revealed his own sighting publicly. "Since the 1940s, the question of UFOs has troubled many factions of society, and will continue to do so unless and until we get some firm answers. At a time in our history when we demand new sources of energy and an intricate understanding of our planet and the universe itself, even the tiniest possibility that the UFO phenomenon might hide a grain of knowledge essential to our lives is reason enough to explore this subject. "As your President, I promise to do everything possible to get the facts out there, if there's anything whatsoever to reveal, because the American people have the right to know the truth and to deal with that truth openly and logically. Thank you." An unlikely scenario? Of course. Republicans, Democrats, The Elite? Change, change, change-a-roo, clippity-cloppity, chippity-choppity change. Yes, we can? No, we can't. The Freedom of Information Act. The Freedom of Misinformation Act. The Freedom of Disinformation Act. How murky the waters. We, out here, shall dream this newest little uninspired dream of conducting science yet unconducted and of releasing information still unreleased, anticipating nothing, simply because the Temple of Nevermind remains open for business 24/7, conveniently and intently serving up the American public's right to know little of importance since the forties and fifties.